The 13 T has an Ohio 1913 plate set. The plates are flat steel with an almond background and maroon numbers. I've looked online and it does appear they are legit 1913 plates, as best as I can tell. BUT, they need some work. I'm sure this is a common question that gets asked once a month, but anyone know a good place to send them to get them restored correctly? And any idea of how much a nice fresh coat of paint (or whatever is involved in a restoration) usually costs, ballpark? Also, where did T owners usually place their license plates on a 13T? The front and back plates are currently attached to the T with some homemade brackets and look a little awkward. Curious where you guys attach your plates and the best way to make them look "right". Mixed blessing on the old tags on the T, the only 13 plates I have are Ohio plates which I want to keep on the T (during shows, parades, etc) since that's where she spent most of her life. However, I can't register those plates in Georgia. So I'll probably get an "historical" GA tag and just temporarily put it on the T with a magnet when on the road. Then take it off when I get where I'm going, so just the Ohio plates are displayed then. That is, unless anyone knows where I might be able to find a 1913 GA Tag (I've looked online and haven't found anything). I believe Georgia used the same issue of plate from 1910-1913, with a new issue in 1914. All are quite uncommon, although they produced about 25,000 in the 1910-13 era. 1915's are porcelain and really the most common early Georgia's-as opposed to the earlier, flimsy steel. Could you post the 1913 Ohio's you have? 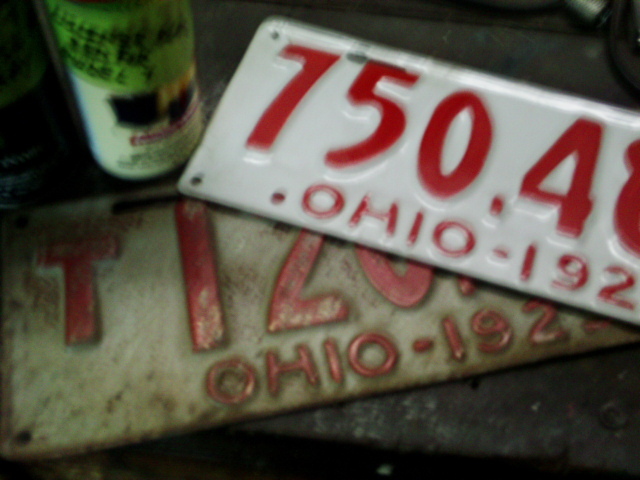 They may seem a little rough, but they could be good by 1913 Ohio plate standards. Because they are flat steel, to have them restored, you might just as well start with a flat piece of steel. As for mounting them on the car, most early T's use a "Neverout" or similar taillight/plate bracket on the back. On the front, they could be mounted under the crank (most common), on the radiator neck, or under the headlight (on the fork). I hope this makes sense, and maybe even helps. I have always understood that the first state plates in Georgia were the 1915 porcelains. I know that in Ala the first plates were 1912. The larger cities had plates there as early as 1909. Miss had plates in 1913. Georgia too may have had the local plates. The round state registration discs may have been earlier than the porcelains. 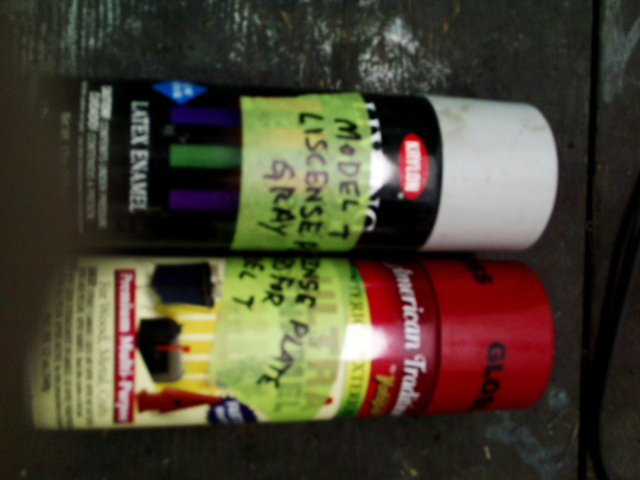 We use simple rattle can paint that, if I remember right, was bought at Lowes. Red: American Tradition by Valspar Interior/Exterior Ultra Enamel # 165837 Cherry Red Gloss. Gray:Krylon Living Color Laytex Enamel #7212 Heather Gray. The restored plate ran on our car for years before we found a pair. Just a good wash and coat of wax a couple times of year. The unrestored plate is for reference. To get a clean crisp edge on the numbers we used a cellophane type material with a sticky back that we found at an art store (which has since closed)and carefully/lightly cut the numbers out with a rasor blade to paint the red on top of the grey base coat.